When I watched Ariel Dorfman’s “Death and the Maiden” (directed by Roman Polanski in 1994) for the first time, I had just entered my teens. And I remember feeling overcome by something that felt like a silver-lined cloud. The silver lining was a sense of inner satisfaction, of the triumph of justice, which my young and passionate mind derived from the film’s final scenes. The storm cloud was – well, everything else. Something wasn’t right. And only with years I was able to pinpoint what it was. The thing is, I was never convinced beyond a reasonable doubt that Doctor Roberto Miranda was guilty. That he is, indeed, the same doctor who tortured the blindfolded Paulina Salas all those years ago; that recognizing his voice in the middle of a stormy night wasn’t a product of her long-tormented mind. At the doctor’s confession in the final scenes (which can be watched here), I remember getting close to being 99% convinced. Ninety-nine percent. And that remaining, relentless 1% has lingered in me ever since. With years, it grew as I grew, as I began to sense that the thinnest of lines in the world are the lines between accusation and confession, between fiction and reality, between repentance and retribution. If one zooms out, it wouldn’t be all too surprising to discover that this one percent of fierce doubt is what led me, over twists and turns, into Memory at War. If I had to name one work of art that combines memory, trauma, and working through the past, it would have to be “Death and the Maiden”. Throughout the play it is uncertain whether details are evidence of Roberto’s guilt or Paulina’s paranoia. At the end of the play it is unclear who is innocent. – thus summarizes Wikipedia. Into the Subject field, the unseen contributors inserted: “The aftereffects of repression on hearts and souls of people in a country emerging from totalitarian dictatorship”. Yes, that is the subject. And no, we never get an answer. But I feel fortunate to have gotten a hint at tackling it. One day, when we were visiting Ariel and his family in North Carolina, someone mentioned the seagulls flying around in that final scene of the film. Through laughter, it came to light that Rodrigo, the eldest son, had been the one feeding them off the edge of the cliffs. He had to pass the long hours of the filming somehow, after all. Since then, I never again saw three characters in “Death and the Maiden”. A fourth presence had taken shape. It was someone beyond the reach of the camera, someone observing, watching. It could have been a young boy feeding seagulls, but just as well, it could have been me. You. Any one of us. Paulina, Gerardo and Roberto are never alone. They stage their long and painful trial, and we are the jury. To this day, the jury is still out. 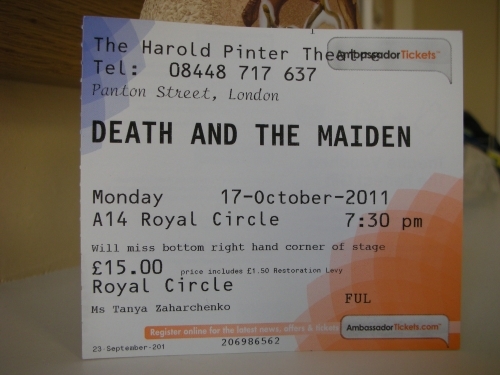 So when I heard that the Harold Pinter Theatre is staging “Death and the Maiden” this fall, I knew I had to go. 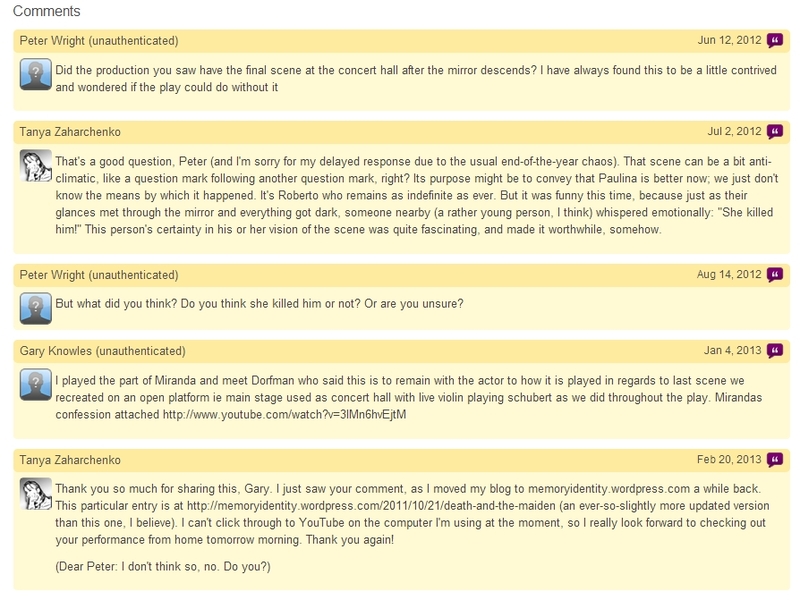 Which I did, this past Monday, October 17, for a preview performance. I walked across Parker’s Piece, hopped on a National Express bus and went to London, to try and finally be convinced. 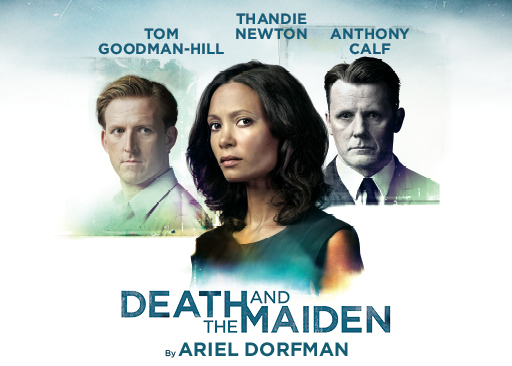 Thandie Newton is Paulina Salas in this classy production, which officially starts on Wed 19 Oct 2011 and runs until Sat 21 Jan 2012. “Death and the Maiden” was written in 1990. We are now twenty-one years into this trial. And we are still listening to the evidence. Despite some moments which might have been better solved differently, this production does an excellent job with, perhaps, the most important of humanity’s thin lines: the one between accusation and confession. As part of Gerardo’s effort to free the man his wife has taken captive, he seeks to ensure that Roberto confesses as convincingly as possible. So he hands Paulina a microphone to tell her side of the story. She sits downstage, surrounded by darkness, and begins to recount how it all started. For a while it is her voice we hear and her face we see; but slowly, lights shift upstage, onto the two men, as Paulina’s words transform into the voice of Roberto, continuing her story of torture. At this transformation of voices – from the accuser to the confessor – my angst-ridden 1% fluttered around the theatre like an insomnia-stricken ghost. Is he telling his own tale, or did she lead him where he must go if he wants to get out alive? Whose voice is Roberto’s? Does he shed his masks, or does he, quite on the contrary, enter a perfectly performed role? These are the same questions, the same doubts from twenty years ago. Had I gone to London for nothing, other than to take another long walk by the Thames? Will this trial never end? But suddenly – again in the final scenes – memory studies awakened in me, and kicked in. What if Roberto confesses, passionately, sincerely, not to what he did, but to what his nation did in his name? Over the course of that long night, picking up the depth of wounds in Paulina, he could, indeed, confess to save his own life. But he could also confess to save hers. Maybe it liberates her from her phantoms. How can I know what goes on in people’s heads after they’ve been… But I think I understand the need of hers, because it coincides with what we were talking about last night, the whole country’s need to put into words what happened to us. What if Roberto’s own guilt doesn’t really matter at the end, because he does just that: put into words what no one had voiced before. Is that not the ultimate responsibility, the ultimate apology to set Paulina, and victims like her, free from the vicious ghosts of memory? My 1% of doubt settled softly back into its usual place as the audience began to applaud, and there it grew eerily still. I stayed for a while, looking at the empty stage. Dr Miranda, did you just consciously carry out what the whole world needed someone to do? What you yourself, perhaps, needed someone to do? What Vladimir Bukovsky described as a prerequisite to the wind’s returning onto its normal path: one person who takes upon himself the sin of the many. The closest I ever came to being convinced of your guilt was through the rising sincerity of your confession. But what if one doesn’t need to be have committed the crime in order to internalize its victims’ pain and sorrow; in order to internalize the perpetrators’ guilt? Is direct personal action the only acceptable qualification for repentance? The play’s main character, I realized then, wasn’t the brave but traumatized Paulina, nor her husband, Gerardo, a human rights lawyer haunted by demons of his own. The real protagonist is the widely despised villain, Doctor Roberto Miranda, the man who, at the end, has agency. And who (out of fear? guilt? or compassion?) chooses to confess. To his own crime or to the crime of his times? Is there a difference? … The jury is still out. But this trial is moving forward. PAULINA: I’m not going to kill you because you’re guilty, Doctor, but because you haven’t repented at all. I can only forgive someone who really repents, who stands up amongst those he has wronged and says, I did this, I did it, and I’ll never do it again. ROBERTO: What more do you want? You’ve got more than all the victims in this country will ever get. [He gets down on his knees.] What more do you want? PAULINA: The truth, Doctor. The truth and I’ll let you go. Repent and I’ll let you go. You have ten seconds. One, two, three, four, five, six. Time is running out. Seven. Say it! ROBERTO: No, I won’t. Because even if I confess, you’ll never be satisfied. You’re going to kill me anyway. So go ahead and kill me. I’m not going to let any sick woman treat me like this. If you want to kill me, do it. But you’re killing an innocent man. ROBERTO: Oh Paulina, isn’t it time we stopped? PAULINA: And why does it always have to be the people like me who have to sacrifice, why are we always the ones who have to make concessions when something has to be conceded, why always me who has to bite her tongue, why? Well, not this time. This time I am going to think about myself, about what I need. If only to do justice in one case, just one. What do we lose? What do we lose by killing one of them? What do we lose? What do we lose?! They freeze in their positions as the lights begin to go down slowly. We begin to hear music from the last movement of Mozart’s Dissonant Quartet. Paulina and Roberto are covered from view by a giant mirror which descends, forcing the audience to look at themselves. Absolutely brilliant! I’m studying the play in my English 11 IB class and this blog allowed me to view Dr.Miranda neither as a victim nor as a culprit but as a character that speaks to the people and the cathartic nature of his presence to the victim. Thank you so much! Thank you for this lovely comment, Suzy. I’m really glad to hear that Dr. Miranda found his way into your thoughts in such a nuanced and intelligent fashion. Kudos to your teacher for including this play in the IB English syllabus! dear Tanya, what do you think of Gerardo’s part in this? His morality and status are at stake here, so what do you think about Gerardo specifically? Is he being fair or unfair from both perspectives? I’m sorry for the delay in responding to your question, Hussein. That’s because (a) May-June are a bit crazy at universities and (b) your question is a great one. In brief, Gerardo is a witness, an often-forgotten but essential part of the eternal equation between perpetrator and victim. I suspect the brilliant author of this play judged his own character, Gerardo, quite harshly, for inactivity / passivity / formality in handling the passions of trauma portrayed in “Death and the Maiden”. As if to say: here is a rules-oriented human rights lawyer; he is doing much when his own wife is in agony?… But I am not ready to pass a verdict on him just yet. Even more: in literary terms, I think Gerardo may be the narrator of the whole story. Would you share your own reflections? They could help me get started. Your perspective is so original and new. I must say I loved this entry and that it gave me insight into a play that I love, and also into a character that is so mysterious. I had never thought of him this way before. It also opened up newer aspects of this play that makes me wonder whether it has more that can only be found, as in your case, after more than one viewing or reading.